As Olympic suppliers and the official sponsor of the US Open and US Nationals, JOOLA brings you top of the line tables in performance and design but at an affordable price. 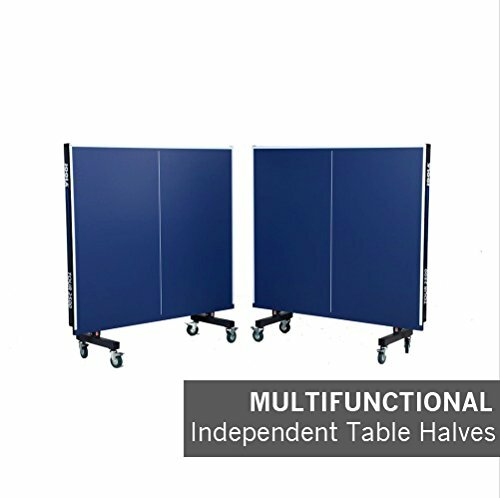 The quality USATT approved choice for schools, recreational facilities, and families, the Tour 2500 bridges the gap between recreational and professional tables. The Tour 2500 features a 1 inch (25mm)painted medium density fiberboard (MDF) surface. The multilayer paint process prevents chipping and warping while creating the ideal surface for a consistent ball bounce and accelerated gameplay. The heavy-duty powder coated 50mm frame and 50x50 mm undercarriage acts as a shield from excessive wear and tear and thus increases the table’s lifespan. The Tour 2500 comes nearly preassembled in two halves facilitating set up and take down, with only 8 bolts needing to be tightened to attach the legs. Each individual half of the table comes with its own trundle system to allow for easier transport and ability to stand alone, as well as be nested together to minimize storage space. 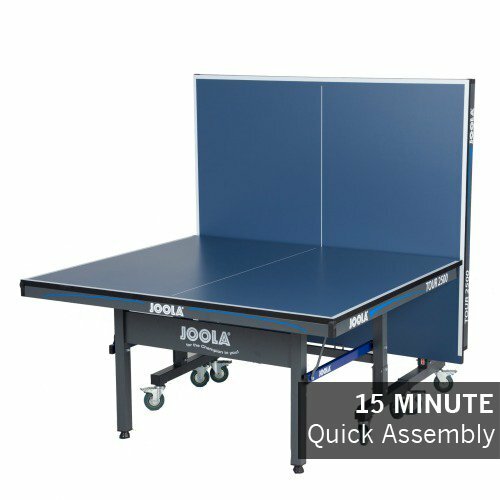 The Joola Tour 2500 Indoor Table Tennis Table features a 1 inch (25mm) playing surface, dual safety locking devices with two separate halves and four wheels per half for easy mobility. It is a USATT approved table and net system ready for tournament level play. It has a playback feature (meaning you can put half of the table up to hit against – if you want to). And it can also be stored away very compact. 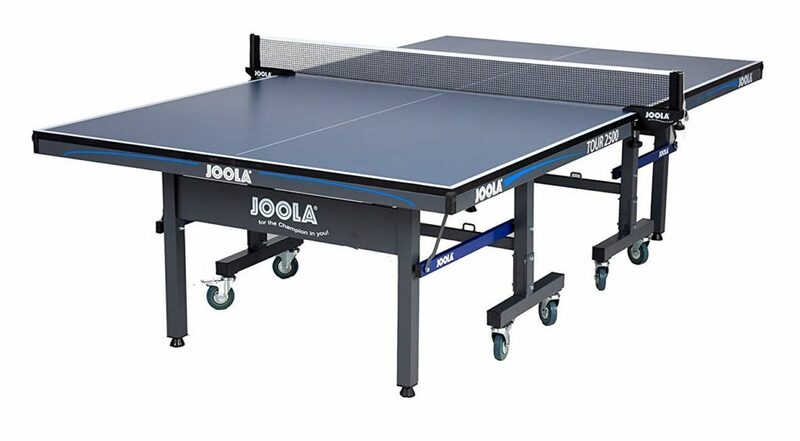 A great thing about the Joola Tour 2500 Indoor Table Tennis Table is the fact that it’s essentially two separate table halves that come together to form the full table. Each standalone half has its own built-in trundle system that allows it to be transported and stored separately. This dual undercarriage system makes the table very easy to maneuver and due to the 3-inch lockable casters, the table rolls smoothly and easily across most surfaces while weighing about 125 pounds each. The Tour 2500 is comprised of auto folding legs, adjustable height levelers, four heavy duty 3-inch lockable casters, and an anti-tilting device for added safety and mobility during transport or conversion to playback mode. The 2500 means the top has a 25mm thickness. This is great for a stable bounce and at this thickness professionals would love practicing on this table.